The average church service lasts up to two hours, and spending those hours in a hard, uncomfortable church chair can make it seem like an eternity. Bad chairs lead to people squirming, fidgeting, and ultimately deciding to go elsewhere for services. The good news? You can keep your congregation comfortable, happy, and attentive with a set of quality church chairs. * Should you buy new? * What should you look for in a church chair? * What are some of the accessories? New church furniture isn't always the best choice. Sure, it may be tempting to outfit your worship hall with a fancy set of brand-new church chairs, but make sure they are within your budget. If you have very limited funds, used church chairs are the solution. How do you find used church chairs? Start by asking around at churches in your area. Many growing churches need to get rid of old church furniture due to expansion, renovation, or redesign. It makes economic and environmental sense for everyone if they can sell that used furniture for a deep discount, or even gift it to a smaller church. There are also several online sources for buying and selling used church furniture. While used church furniture may have an enticing price tag, it might not make the best impression. Even gently used church chairs may be marred with scratches, scuffs, and stains. They also may not match with the rest of your décor. Used church chairs can carry your organization through tough times, but, before long, most churches will find themselves ready to trade up to their own new set of church chairs, one that will be large enough to serve the growing congregation, make a great impression, and provide lasting comfort and support. On average, church chair seats measure from 18 to 22 inches wide; this is a good two to five inches wider than narrower banquet or stack chairs. These extra inches not only provide extra comfort and support, but allow you to set your church chairs close together in rows without squishing your congregants. If you want your chairs to form a nice, straight row without gaps between, you should select a chair with a minimum width of 18 inches. 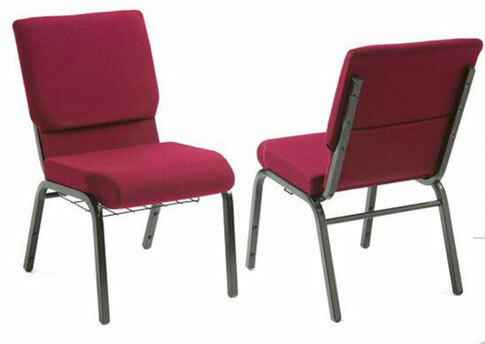 Church chairs with smaller seat widths will work when they are set slightly apart from other chairs. If your church chairs will be doing double or triple duty as banquet, auditorium, and church chairs, you may want to choose a narrower, lighter chair style. Most modern churches are multi-purpose. In addition to regular services, they may host weddings, youth dances, and community meetings. Your church chairs need to adapt to any situation. Choosing a stacking church chair gives you the flexibility to move a large amount of church chairs and store them in a small area. Not only does this give your space more options, but it makes cleaning the floors much easier. Church chair padding should be thick and comfortable. The longer a person sits, the more pressure is placed on the body. This means that over the course of a long service, a chair will become increasingly uncomfortable. Even if a person might be up and down throughout the church service, they usually won't spend much time standing. At least one inch of foam seat padding is recommended for every hour spent sitting. It is worth noting that extra padding may be considered controversial depending on the nature of the church and its membership. Half a century ago, church chair padding was a rare luxury, and some still consider it too "soft" for more austere church environments. Involving the church membership in the search for church chairs may alleviate any objections. The best upholstery choice for most church chairs is a stain-resistant, heavy-duty fabric that coordinates with the church's décor. By far, the most popular styles are bright, solid colors that are bold and cheerful without being garish and gaudy. Vinyl upholstery may also be an option if your church chairs have to travel outside. Vinyl is tougher than fabric and is especially spill-resistant. In a warm environment, however, vinyl can trap heat and cause discomfort. Steel church chair frames are tough and cost-effective. Steel frames come in a variety of frame finishes that either accent your chair upholstery or subtly blend into the room, depending on your preference. Some churches don't mind the extra expense for the quality look and warmth of wood framed chairs. Wood framed church chairs are built with solid bases and extra supports to survive just as long, if not longer, than their metal-framed counterparts. Many find the natural feeling of wood chairs adds a vital element to the service. Ganging brackets (also called ganging devices or ganging clamps) hook chairs together to form a solid row. This keeps your chairs organized and prevents people from moving them all over the room. Bookracks are perfect for keeping hymnals and other materials handy. Kneelers attach to chairs to allow members of the congregation to kneel down during prayer. Many are padded for comfortable kneeling. Churches are as unique as fingerprints, and each has its own special seating needs. With some careful consideration, you can purchase church chairs that will keep your congregation eager to come back for more.